Amyotrophic lateral sclerosis (ALS) is a heterogeneous disease with either sporadic or genetic origins characterized by the progressive degeneration of motor neurons. At the cellular level, ALS neurons show protein misfolding and aggregation phenotypes. Transactive response DNA-binding protein 43 (TDP-43) has recently been shown to be associated with ALS, but the early pathophysiological deficits causing impairment in motor function are unknown. Here we used Caenorhabditis elegans expressing mutant TDP-43A315T in motor neurons and explored the potential influences of calcium (Ca2+). Using chemical and genetic approaches to manipulate the release of endoplasmic reticulum (ER) Ca2+stores, we observed that the reduction of intracellular Ca2+ ([Ca2+]i) rescued age-dependent paralysis and prevented the neurodegeneration of GABAergic motor neurons. Our data implicate elevated [Ca2+]i as a driver of TDP-43-mediated neuronal toxicity. Furthermore, we discovered that neuronal degeneration is independent of the executioner caspase CED-3, but instead requires the activity of the Ca2+-regulated calpain protease TRA-3, and the aspartyl protease ASP-4. Finally, chemically blocking protease activity protected against mutant TDP-43A315T-associated neuronal toxicity. This work both underscores the potential of the C. elegans system to identify key targets for therapeutic intervention and suggests that a focused effort to regulate ER Ca2+ release and necrosis-like degeneration consequent to neuronal injury may be of clinical importance. Amyotrophic lateral sclerosis (ALS) is a fatal neurodegenerative disease characterized by the selective loss of both upper and lower motor neurons in the cortex and spinal cord (Wijesekera and Leigh, 2009). ALS is an age-dependent, rapidly progressive disease with life expectancy typically being between 2 and 5 years after onset. Thanks to recent genetic advances, causative mutations for ALS have been discovered in over a dozen genes (Renton et al., 2014), including one encoding transactive response DNA-binding protein 43 (TDP-43; Kabashi et al., 2008) among others. Evidence is mounting that pathways regulating protein degradation may influence ALS pathogenesis (Blokhuis et al., 2013). We previously reported that mutant TDP-43A315T proteins expressed in Caenorhabditis elegans motor neurons are susceptible to misfolding, leading to insolubility, aggregation (Vaccaro et al., 2012a), and activation of the endoplasmic reticulum (ER) unfolded protein response (UPRER; Vaccaro et al., 2012b, 2013). Induction of the UPRER by mutant TDP-43 suggests that the capacity of the ER to properly fold proteins may be exceeded, leading to cellular dysfunction and death (Walker and Atkin, 2011). The ER constitutes a Ca2+ store whose uptake and release are extensively regulated to maintain cellular Ca2+ homeostasis, and disrupted ER function can induce Ca2+ depletion (Burdakov and Verkhratsky, 2006). Altered Ca2+ homeostasis has been investigated as a mechanism to distinguish motor neurons that are vulnerable or resistant to degeneration in ALS (Palecek et al., 1999; Vanselow and Keller, 2000). Indeed, ALS-vulnerable motor neurons in mice display Ca2+ buffering capacities that are five to six times lower compared with those found in ALS-resistant oculomotor neurons (Vanselow and Keller, 2000), while a more recent study has shown that altered Ca2+ buffering may be a risk factor for SOD-1 toxicity (von Lewinski et al., 2008). We investigated the role of cellular Ca2+ balance in our TDP-43 models to learn more about the mechanisms of Ca2+-mediated cellular demise. We report that a null mutation in calreticulin (CRT-1), a central regulator of ER Ca2+ homeostasis, suppresses both paralysis and the neurodegeneration caused by mutant TDP-43A315T in motor neurons. Furthermore, deletion of the Ca2+ binding ER protein calnexin (CNX-1), the ER Ca2+ release channels UNC-68 (ryanodine receptor), or ITR-1 (inositol 1,4,5 triphosphate receptor) suppressed TDP-43 toxicity. Consistently, pharmacological manipulations modulating ER Ca2+ release and/or uptake suppressed TDP-43 toxicity. Downstream from perturbed Ca2+ homeostasis, we discovered that mutations in the Ca2+-regulated calpain protease TRA-3 and aspartyl protease ASP-4 also suppressed TDP-43 toxicity. Our findings suggest that the regulation, and possibly release, of ER Ca2+ stores are required for neurotoxicity of TDP-43 in C. elegans. It is generally believed that caspase-driven neuronal apoptosis is an underlying pathogenic mechanism in many late-onset neurodegenerative diseases including ALS (Martin, 1999), but the executioner caspase CED-3 is dispensable for neurodegeneration in our TDP-43 model. Instead, the involvement of calpain and aspartyl proteases is more similar to necrosis-mediated cell death (Syntichaki et al., 2002). We propose that misfolded mutant TDP-43 increases [Ca2+]i by disrupting ER function and activates calpain proteases, which in turn activates killer aspartyl proteases, leading to cell destruction. C. elegans strains and methods. Standard culturing and genetic methods were used (Stiernagle, 2006). Animals were maintained at 20°C unless otherwise indicated. Unless otherwise stated, the strains used in this study were obtained from the Caenorhabditis Genetics Center (University of Minnesota, Minneapolis, MN) and include the following: asp-4(ok2693), ced-3(ok2734), cnx-1(nr2009), cnx-1(nr2010), crt-1(bz30), crt-1(jh101), itr-1(sa73), kbIs7 [nhx-2p::rde-1 + rol-6(su1006)], kzIs20[pDM#715(hlh-1p::rde-1) + pTG95(sur-5p::nls::GFP)], oxIs12 [unc-47p::GFP + lin-15(+)], rde-1(ne219), sid-1(pk3321), tra-3(ok2207), uIs69 [pCFJ90(myo-2p::mCherry) + unc-119p::sid-1], and unc-68(e540). Genetic crosses generated transgenic/mutant combinations, and the presence of transgenes and mutations was confirmed by PCR, visible markers, sequencing, or a combination thereof. Transgenic lines expressing mutant TDP-43A315T, wild-type TDP-43 (TDP-43WT), unc-47p::GFP; TDP-43A315T, and unc-47p::GFP; TDP-43WT were previously described (Vaccaro et al., 2012a) and created as follows: human cDNAs for TDP-43WT and TDP-43A315T (a gift from Dr. Guy Rouleau, McGill University, Montreal, QC, Canada) were amplified by PCR and cloned into the Gateway vector pDONR221 following the manufacturer's protocol (Invitrogen). Multisite Gateway recombination was performed with the pDONR TDP-43 clones along with clones containing the unc-47 promoter (a gift from Dr. Erik Jorgensen, University of Utah, Salt Lake City, UT; and Dr. Marc Hammarlund, Yale University, New Haven, CT), the unc-54 3′ UTR plasmid pCM5.37 (Addgene plasmid 17253; a gift from Dr. Geraldine Seydoux, Johns Hopkins University, Baltimore, MD), and the destination vector pCFJ150 (Addgene plasmid 19329; a gift from Dr. Erik Jorgensen, University of Utah) to create unc-47p::TDP-43 expression vectors. Transgenic lines were created by microinjection of unc-119(ed3) worms, multiple lines were generated, and strains behaving similarly were kept for further analysis. Transgenes were integrated by UV irradiation, and lines were outcrossed to wild-type N2 worms five times before use. Several strains showing comparable phenotypes and transgene expression levels were kept and the strains used in this study include the following: xqIs132[unc-47p::TDP-43WT; unc-119(+)] and xqIs133[unc-47p::TDP-43A315T;unc-119(+)]. All chemicals were obtained from Sigma-Aldrich. Dantrolene and thapsigargin were dissolved in DMSO and added to agar plate to final concentrations of 10 μm and 3 μg/ml, respectively. EGTA was dissolved in 1N NaOH and was added to agar plates to a final concentration of 0.5 mm. MDL-28170 was dissolved in DMSO and added to agar plate to a final concentration of 20 μm. Worms were grown at 20°C on standard Nematode Growth Media (NGM) plates with or without compounds (30 animals/plate, by triplicates) and scored daily for movement. Animals were scored as paralyzed if they failed to move upon prodding with a worm pick. Failure to move their head to touch and the absence of pharyngeal pumping was scored as dead. Statistical analysis was performed using GraphPad Prism software (log-rank Mantel–Cox test). Worms (unc-47p::GFP; TDP-43A315T or unc-47p::GFP; TDP-43WT, with or without additional mutations listed above) were grown at 20°C on standard NGM plates with or without compounds. Young adult worms were transferred onto seeded NGM plates (with or without compounds), and were selected at days 1, 5, and 9 of adulthood (100 animals/treatment). Live worms were placed on a 2% agarose pad containing 5 mm levamisole in M9 medium to immobilize the worms. Worms were observed under fluorescence microscopy (Leica 6000 microscope) and scored for gaps or breaks in the processes of GABAergic neurons. The mean and SEM were calculated, and ANOVA with Bonferroni correction were used for statistical analyses. RNA interference (RNAi)-treated strains were fed Escherichia coli (HT115) containing an empty vector (EV) or an RNAi clone corresponding to the gene of interest indicated above. All RNAi clones were from the ORFeome RNAi library (Open Biosystems). RNAi experiments were performed at 20°C. Worms were grown on NGM enriched with 1 mm isopropyl-β-d-thiogalactopyranoside. All RNAi paralysis tests were performed using a TDP-43A315T; unc-47p::GFP in conjunction with the appropriate mutation and transgenes for tissue-specific silencing in neurons, intestine, or muscle cells based on strains TU3401, VP303, or NR350, respectively. To minimize developmental effects, L4 worms were grown on plates with RNAi bacteria and assayed for paralysis as adults. Worms were transferred every 2 d.
Synchronized populations of worms expressing TDP-43 were grown at 20°C on standard NGM plates with or without compounds (15 plates/treatment). Immunoblot analysis of protein levels was performed on whole-animal extracts prepared by washing animals in M9 medium to remove adherent bacteria. The pellets were placed at −80°C overnight and homogenized in 1 ml/g RIPA buffer (150 mm NaCl, 50 mm Tris, pH 7.4, 1% Triton X-100, 0.1% SDS, 1% sodium deoxycholate) plus 0.1% protease inhibitors (10 mg/ml leupeptin, 10 mg/ml pepstatin A, 10 mg/ml chymostatin; 1:1000). Pellets were sonicated and centrifuged at 16,000 × g. Supernatants were collected and were saved as the total fraction. Protein concentrations were determined by the Quick Start Bradford Protein Assay (Bio-Rad). Supernatants, 50 μg/well, were subjected to SDS-PAGE (10%) and transferred to nitrocellulose membranes (Bio-Rad). The immunoblotting analyses were performed using the following antibodies: rabbit anti-TDP-43 (1:1000; Proteintech) and mouse anti-actin (1:20,000 for worms; MP Biomedicals). Proteins were visualized using peroxidase-conjugated secondary antibodies and ECL Western Blotting Substrate (Thermo Scientific). Densitometry was performed with Photoshop (Adobe). CRT-1 is a Ca2+ binding/storing protein of the ER that serves both as a molecular chaperone and as a central regulator of Ca2+ homeostasis (Michalak et al., 1999). Worms expressing mutant TDP-43 in their motor neurons show age-dependent motility defects, leading to paralysis and neurodegeneration (Vaccaro et al., 2012a). To investigate the role of Ca2+ balance in TDP-43 neuronal toxicity, we constructed crt-1(bz30); TDP-43A315T and crt-1(jh101); TDP-43A315T strains, and scored them for paralysis. We observed a significant reduction in the rate of paralysis for crt-1(bz30); TDP-43A315T and crt-1(jh101); TDP-43A315T animals compared with control TDP-43A315T transgenics (Fig. 1A). Focusing on crt-1(bz30); TDP-43A315T, we also observed a significant rate of motor neuron degeneration compared with control TDP-43A315T transgenics (Fig. 1B). Genes regulating ER calcium release promote TDP-43 neuronal toxicity. A, Null mutations in cnx-1 or crt-1 suppress age-dependent paralysis caused by TDP-43A315T compared with transgenic TDP-43A315T controls. p < 0.0001 for TDP-43A315T; cnx-1(nr2009) versus TDP-43A315T; p = 0.0002 for TDP-43A315T; cnx-1(nr2010) versus TDP-43A315T; p < 0.0001 for TDP-43A315T; crt-1(bz30) versus TDP-43A315T; p < 0.0001 for TDP-43A315T; crt-1(jh101) versus TDP-43A315T. TDP-43A315T, n = 114 ; TDP-43A315T; cnx-1(nr2009), n = 76; TDP-43A315T; cnx-1(nr2010), n = 98; TDP-43A315T; crt-1(bz30), n = 90; and TDP-43A315T; crt-1(jh101), n = 63. B, Mutations in cnx-1 or crt-1 reduce age-dependent neurodegeneration in TDP-43 A315T transgenics compared with TDP-43A315T control animals. ***p < 0.001 versus TDP-43A315T at day 9; ****p < 0.0001 versus TDP-43A315T at day 9. C, Null mutations in unc-68 and itr-1 reduce TDP-43A315T-mediated paralysis compared with control TDP-43A315T transgenics. p < 0.0001 for either for TDP-43A315T; unc-68(e540) or for TDP-43A315T; itr-1(sa73) versus TDP-43A315T. TDP-43A315T, n = 90; TDP-43A315T; itr-1(sa73), n = 88; and TDP-43A315T; unc-68(e540), n = 84. D, Degeneration of motor neurons is reduced in adult day 9 TDP-43A315T transgenics compared with controls. **p < 0.01 versus TDP-43A315T at day 9. E, Western blotting with a human anti-TDP-43 antibody revealed comparable levels of protein expression in all strains. In the ER, calreticulin works in conjunction with CNX-1 to execute chaperone functions and mediate cellular Ca2+ homeostasis (Krause and Michalak, 1997). Given the functional and structural similarities between the two proteins, we tested whether calnexin, encoded by cnx-1 in C. elegans, also influenced TDP-43 toxicity. We observed that introduction of the loss of function mutations cnx-1(nr2009) or cnx-1(nr2010) into mutant TDP-43A315T transgenics led to a significant decrease in paralysis compared with control TDP-43A315T transgenics (Fig. 1A). Focusing on cnx-1(nr2010); TDP-43A315T, we also observed a significant decrease of motor neuron degeneration compared with control TDP-43A315T transgenics (Fig. 1B). To complete the genetic investigation of cellular Ca2+ balance, we tested the following two other genes involved in ER regulation of [Ca2+]i: the ER Ca2+ release channel inositol triphosphate receptor channel InsP3R, encoded by itr-1 (Dal Santo et al., 1999), and the ER Ca2+ release channel ryanodine receptor channel RyR, encoded by unc-68 (Maryon et al., 1996). We then investigated the effects of mutations in the InsP3R and RyR genes on TDP-43A315T-mediated paralysis and motor neuron degeneration. Similar to the disruption of calnexin and calreticulin function, itr-1(sa73); TDP-43A315T and unc-68(e540); TDP-43A315T strains displayed significantly reduced paralysis and motor neuron degeneration phenotypes compared with TDP-43A315T controls (Fig. 1C,D). To confirm that the suppression of TDP-43A315T neuronal toxicity was not due to transgene effects, we quantified the level of TDP-43 protein expression by immunoblotting and observed no difference in protein levels for TDP-43 in combination with any of the mutations (Fig. 1E). To confirm that altering [Ca2+]i levels in turn regulates TDP-43 toxicity, we turned to a complementary approach by using chemical reagents to manipulate ER Ca2+release and/or uptake. We first treated TDP-43A315T mutants with EGTA, a Ca2+-specific chelator, and observed a clear reduction in the rate of paralysis and neurodegeneration compared with untreated TDP-43A315T transgenics (Fig. 2A,B). Additionally, EGTA did not further suppress paralysis and neurodegeneration in crt-1(bz30); TDP-43A315T or itr-1(sa73); TDP-43A315T strains (Fig. 2A,B), suggesting that crt-1, itr-1, and EGTA use a common mechanism to reduce TDP-43 toxicity, namely reduced [Ca2+]i.
Pharmacological manipulation of [Ca2+]i reduces TDP-43 neuronal toxicity. A, TDP-43A315T transgenics treated with EGTA showed significantly less paralysis compared with untreated controls (p < 0.0001 versus TDP-43A315T). The protective effect of EGTA was not additive to the suppression of TDP-43-mediated paralysis by mutation in either crt-1 or itr-1. p = 0.8470 versus TDP-43A315T; crt-1(bz30); and p = 0.7817 versus TDP-43A315T; itr-1(sa73). TDP-43A315T, n = 90 ; TDP-43A315T + EGTA, n = 181 ; TDP-43A315T; itr-1(sa73), n = 90; TDP-43A315T; itr-1(sa73) + EGTA, n = 90; TDP-43A315T; crt-1(bz30), n = 90; TDP-43A315T; crt-1(bz30) + EGTA, n = 90. B, Degeneration of motor neurons in TDP-43A315T animals at day 9 of adulthood was reduced to comparable levels in TDP-43A315T transgenics treated with EGTA alone or in combination with mutations in crt-1 or itr-1. ****p < 0.0001 versus TDP-43A315T at day 9. C, Treatment with dantrolene suppressed TDP-43A315T-mediated paralysis compared with untreated control animals (p = 0.0031 versus TDP-43A315T). Suppression of TDP-43A315T-mediated paralysis by crt-1 or itr-1 was not significantly different from these same mutant strains treated with dantrolene. TDP-43A315T, n = 114 ; TDP-43A315T + dantrolene, n = 100; TDP-43A315T; itr-1(sa73), n = 88; TDP-43A315T; itr-1(sa73) + dantrolene, n = 96; TDP-43A315T; crt-1(bz30), n = 90; TDP-43A315T; crt-1(bz30) + dantrolene, n = 90. D, Degeneration of motor neurons, in TDP-43A315T animals at day 9 of adulthood was reduced to similar levels in TDP-43A315T transgenics treated with dantrolene alone or in combination with mutations for crt-1 or itr-1. **p < 0.01 versus TDP-43A315T at day 9; ***p < 0.001 versus TDP-43A315T at day 9. E, TDP-43 protein expression was unchanged by culture conditions with EGTA or dantrolene. We next tested whether Ca2+ derived from ER stores might contribute to the progressive paralysis caused by mutant TDP-43. We treated TDP-43A315T mutants with dantrolene, a reagent that specifically inhibits Ca2+ release from ER stores (Song et al., 1993). In dantrolene-treated animals, paralysis and neurodegeneration were markedly reduced consistent with the hypothesis that ER Ca2+ stores contribute to TDP-43 neuronal toxicity (Fig. 2C,D). Dantrolene treatment did not further suppress paralysis and neurodegeneration phenotypes caused by TDP-43A315T in crt-1(bz30) and itr-1(sa73) mutants, suggesting a shared mechanism of action (Fig. 2C,D). 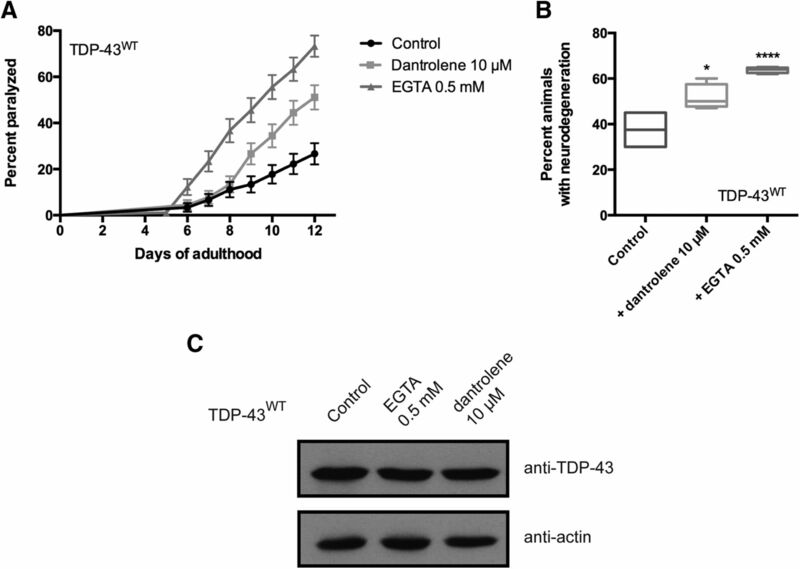 The suppression of TDP-43 toxicity by EGTA and dantrolene were not due to reduced transgene expression since similar levels of TDP-43 protein expression were detected by immunoblotting in treated and untreated TDP-43 transgenics (Fig. 2E). We previously reported that worms expressing mutant TDP-43, but not wild-type TDP-43, show elevated ER and oxidative stress (Vaccaro et al., 2013). Ca2+ release and uptake is essential for normal cellular function, and we hypothesized that chemically manipulating [Ca2+]i may only be beneficial to neurons expressing mutant TDP-43 if disrupted Ca2+ homeostasis is indeed an underlying mechanism of mutant TDP-43 toxicity. To explore this possibility, we tested transgenics expressing TDP-43WT with EGTA or dantrolene, and observed that exposure to either compound greatly enhanced paralysis and neurodegeneration (Fig. 3). Thus, chemically manipulating [Ca2+]i is beneficial only to neurons expressing mutant TDP-43 proteins. Disrupted Ca2+ homeostasis enhances wild-type TDP-43 toxicity. A, Transgenic worms expressing TDP-43WT treated with either EGTA or dantrolene had increased rates of paralysis compared with untreated controls (p < 0.01 for dantrolene-treated worms versus untreated TDP-43WT controls; p < 0.0001 for EGTA-treated worms versus untreated TDP-43WT controls). TDP-43WT, n = 90; TDP-43WT + dantrolene, n = 90; TDP-43WT + EGTA, n = 90. B, Treatment with dantrolene or EGTA increased neurodegeneration in adults on day 9; TDP-43WT transgenics compared with untreated TDP-43WT transgenics. *p < 0.05 versus TDP-43WT at day 9, ****p < 0.0001 versus TDP-43WT at day 9. C, Similar levels of TDP-43 proteins were detected by Western blotting in untreated TDP-43WT transgenics compared with animals treated with EGTA or dantrolene. We next explored whether forced ER Ca2+ release might overcome the crt-1-induced block on TDP-43-mediated paralysis and neurodegeneration. Here, we sought to reverse crt-1-dependent suppression of TDP-43 neuronal toxicity by driving release of the remaining ER Ca2+ stores in TDP-43A315T; crt-1(bz30) animals. We treated TDP-43A315T; crt-1(bz30) animals, which are fully suppressed for paralysis and neurodegeneration, with thapsigargin, a compound that inhibits the sarcoplasmic/endoplasmic reticulum Ca2+ ATPase (SERCA) ER Ca2+ reuptake pump and induces the release of ER Ca2+ via the InsP3 receptor channel (Takemura et al., 1989). We found that thapsigargin treatment significantly restored paralysis and neurodegeneration in TDP-43A315T; crt-1(bz30) mutants compared with chemically untreated controls (Fig. 4A,B). As a positive control, we exposed transgenics expressing TDP-43WT to thapsigargin, and we observed the enhancement of paralysis and neurodegeneration phenotypes (Fig. 4A,B), suggesting that increased [Ca2+]i induces cellular damage in C. elegans. Finally, using immunoblotting we confirmed that treatment with thapsigargin did not affect the expression of TDP-43 transgenes (Fig. 4C). In summary, these data suggest that the elevation of [Ca2+]i itself may be cytotoxic in nematode motor neurons, supporting a model in which a critical rise in [Ca2+]i is a causative factor in neurotoxicity, and that CRT-1 is not required for thapsigargin-induced cell death. Forced release of ER Ca2+ stores enhances TDP-43 neuronal toxicity. A, Paralysis was enhanced in TDP-43A315T; crt-1(bz30) and TDP-43WT transgenics treated with thapsigargin compared with untreated transgenic controls. p < 0.001 for TDP-43A315T; crt-1(bz30) animals versus those treated with thapsigargin; p < 0.001 for TDP-43WT versus those treated with thapsigargin. TDP-43WT, n = 98; TDP-43WT + thapsigargin, n = 95; TDP-43A315T; crt-1(bz30), n = 96; TDP-43A315T; crt-1(bz30) + thapsigargin, n = 100. B, Thapsigargin enhanced neurodegeneration transgenics expressing TDP-43WT at days 1, 5, and 9 of adulthood compared with untreated controls. The suppression of neurodegeneration in TDP-43A315T; crt-1(bz30) animals was lost by thapsigargin treatment in adult day 9 transgenics. ***p < 0.001 versus TDP-43WT at day 1; ****p < 0.0001 versus TDP-43WT or TDP-43A315T; crt-1(bz30). C, Thapsigargin did not affect TDP-43 protein expression in TDP-43WT or TDP-43A315T worms. Caspase-dependent apoptosis is a major mechanism promoting cell death in neurodegenerative diseases (Fuchs and Steller, 2011). To determine whether apoptosis was involved in TDP-43 toxicity, we disrupted the main executioner protease, caspase CED-3, which mediates programmed cell death in C. elegans (Ellis and Horvitz, 1986). We observed that ced-3 was not required for paralysis or degenerative phenotypes induced by mutant TDP-43A315T in motor neurons (Fig. 5A,B). Thus, having shown that genetic and pharmacological manipulation of [Ca2+]i suppresses neurotoxic effects of TDP-43A315T in motor neurons, and based on the “calpain–cathepsin” hypothesis described previously (Yamashima et al., 1998), we investigated aspartyl and calpain protease function in paralysis and neurodegeneration. There are 17 genes with similarity to calpain, 7 of which show significant identity to mammalian calpains (Syntichaki et al., 2002), and 7 aspartyl protease genes encoded in the C. elegans genome (Tcherepanova et al., 2000). Based on previous work linking some of these genes to neurodegeneration in C. elegans (Syntichaki et al., 2002), as well as the availability of viable loss-of-function mutant strains, we focused on the Ca2+-regulated calpain protease TRA-3 and the aspartyl protease ASP-4. Furthermore, asp-4 has previously been identified as a modifier of α-synuclein toxicity in C. elegans (Qiao et al., 2008). Using null mutants for tra-3 and asp-4, we scored for paralysis and neurodegeneration in strains expressing TDP-43A315T. We observed a significant reduction in the rate of paralysis and the progressive degeneration of motor neurons for TDP-43A315T; tra-3(ok2207) or TDP-43A315T; asp-4(ok2693) animals compared with control TDP-43A315T strains (Fig. 5A,B). To confirm that these calpain and aspartyl proteases acted downstream of elevated [Ca2+]i to regulate mutant TDP-43 toxicity, we treated TDP-43A315T; tra-3(ok2207) and TDP-43A315T; asp-4(ok2693) strains with thapsigargin. We observed that thapsigargin treatment failed to restore TDP-43A315T-induced paralysis and neurodegeneration when the calpain or aspartyl proteases were absent (Fig. 5C,D). These data suggest that tra-3 and asp-4 are essential for calcium-mediated neurotoxicity associated with mutant TDP-43, and that these proteases may be a terminal effector of neurodegeneration. Furthermore, TDP-43 transgene expression was not affected by mutations in ced-3, tra-3, or asp-4 (Fig. 5E). We next wanted to determine whether the calpain–aspartyl protease pathway could be a target for small-molecule intervention against TDP-43 toxicity. Z-Val-Phe-CHO (MDL-28170) is a calpain inhibitor previously shown to suppress necrosis in C. elegans (Syntichaki et al., 2002). We observed a significant reduction of TDP-43A315T-mediated paralysis in worms treated with MDL-28170 (Fig. 5F). These data suggest that calpain and aspartyl proteases may be targeted for preventing neurodegeneration associated with mutant ALS proteins. Calpain and aspartyl proteases facilitate TDP-43 neuronal toxicity. A, Null mutations in tra-3 or asp-4 suppress age-dependent paralysis in TDP-43A315T transgenics compared with TDP-43A315T controls. Mutation in ced-3 had no significant effect on paralysis phenotypes compared with TDP-43A315T. p < 0.0001 for TDP-43A315T; tra-3(ok2207) or TDP-43A315T; asp-4(ok2693) versus TDP-43A315T transgenic controls. TDP-43A315T, n = 90; TDP-43A315T; tra-3(ok2207), n = 102; TDP-43A315T; asp-4(ok2693), n = 79; TDP-43A315T; ced-3(ok2734), n = 96. B, Neurodegeneration was significantly reduced in adult, day 9, TDP-43A315T transgenics by tra-3 or asp-4 null mutations compared with TDP-43A315T alone. A null mutation of ced-3 failed to suppress TDP-43A315T neurodegeneration. ****p < 0.0001 versus TDP-43A315T at day 9. C, The suppression of TDP-43A315T-mediated paralysis by tra-3 or asp-4 was unaffected by the addition of thapsigargin. p < 0.0001 for TDP-43A315T versus TDP-43A315T; tra-3(ok2207) or TDP-43A315T; asp-4(ok2693) with or without thapsigargin treatment. TDP-43A315T, n = 90; TDP-43A315T; tra-3(ok2207), n = 90; TDP-43A315T; tra-3(ok2207) + thapsigargin, n = 90; TDP-43A315T; asp-4(ok2693), n = 90; TDP-43A315T; asp-4(ok2693) + thapsigargin, n = 90. D, Suppression of age-dependent neurodegeneration in TDP-43A315T transgenics by tra-3 or asp-4 mutations was unchanged by thapsigargin treatment. ****p < 0.0001 versus TDP-43A315T at day 9. E, Null mutations of tra-3, asp-4, or ced-3 did not affect TDP-43 protein expression. F, The calpain inhibitor MDL-28170 reduced paralysis in TDP-43A315T transgenics. p < 0.001 for treated versus untreated TDP-43A315T animals. TDP-43A315T, n = 92; TDP-43A315T + MDL-28170, n = 82. We wondered whether the regulation of TDP-43 toxicity was specific to tra-3 and asp-4, or involved additional calpain and aspartyl proteases. Using RNAi, we conducted a blind screen of five calpain (clp-1, clp-2, clp-4, clp-7, and tra-3) and seven aspartyl (asp-1, asp-3, asp-4, asp-6, asp-7, asp-10, and asp-13) protease genes against TDP-43A315T transgenics engineered for RNAi sensitivity only within the nervous system (Calixto et al., 2010). We observed that RNAi against only tra-3 or asp-4 significantly suppressed the paralysis phenotype of TDP-43A315T transgenics (Fig. 6A,B). In conjunction with our experiments using null mutants, our RNAi experiments suggest that the regulation of TDP-43A315T toxicity is specific to tra-3 and asp-4. We wondered whether the effects of tra-3 and asp-4 in mediating TDP-43A315T motor defects were cell autonomous or cell nonautonomous. We conducted tra-3 or asp-4 RNAi experiments in TDP-43A315T transgenics sensitized to RNAi only within intestinal cells or body wall muscle cells. We observed no significant reduction of paralysis by tra-3 or asp-4 RNAi targeted to intestinal or body wall muscle cells (Fig. 6C,D). These data suggest that motor defects and degenerative phenotypes caused by TDP-43A315T require the activity of tra-3 and asp-4 in the nervous system, and are not likely to be influenced by protease activity in other tissues. Unfortunately, we could not extend this analysis to Ca2+ homeostasis genes since crt-1 and itr-1 RNAi were ineffective in our assays. TDP-43-mediated motility defects require tra-3 and asp-4 in the nervous system. A, RNAi against tra-3 suppressed TDP-43A315T-mediated paralysis. p < 0.05 for TDP-43A315T treated with tra-3(RNAi) versus TDP-43A315T treated with EV control RNAi. TDP-43A315T + EV, n = 71; TDP-43A315T + clp-1(RNAi), n = 71; TDP-43A315T + clp-2(RNAi), n = 84; TDP-43A315T + clp-4(RNAi), n = 79; TDP-43A315T + tra-3(RNAi), n = 68; TDP-43A315T + clp-7(RNAi), n = 69. B, RNAi against asp-4 suppressed TDP-43A315T-mediated paralysis. p < 0.05 for TDP-43A315T treated with asp-4(RNAi) versus TDP-43A315T treated with EV control RNAi. TDP-43A315T + EV, n = 71; TDP-43A315T + asp-1(RNAi), n = 54; TDP-43A315T + asp-3(RNAi), n = 66; TDP-43A315T + asp-4(RNAi), n = 67; TDP-43A315T + asp-6(RNAi), n = 59; TDP-43A315T + asp-7(RNAi), n = 62; TDP-43A315T + asp-10(RNAi), n = 68; TDP-43A315T + asp-13(RNAi), n = 58. C, There were no significant differences in the rates of paralysis for TDP-43A315T sensitized for intestine-specific RNAi by treatment with EV(RNAi), tra-3(RNAi), or asp-4(RNAi). TDP-43A315T + EV, n = 77; TDP-43A315T + tra-3(RNAi), n = 54; TDP-43A315T + asp-4(RNAi), n = 59. D, There were no significant differences in the rates of paralysis for TDP-43A315T sensitized for body wall muscle-specific RNAi by treatment with EV(RNAi), tra-3(RNAi), or asp-4(RNAi). TDP-43A315T + EV, n = 64; TDP-43A315T + tra-3(RNAi), n = 51; TDP-43A315T + asp-4(RNAi), n = 60. Since our primary assay to identify neuroprotective agents depends on a behavioral assay to detect improved motility of TDP-43A315T transgenics, there is the possibility that we may have identified mutants that nonspecifically augment motility phenotypes. To rule this out, we turned to our TDP-43WT strains that show limited toxicity, with paralysis phenotypes comparable to the expression of GFP alone (Vaccaro et al., 2012a). We crossed itr-1(sa73), unc-68(e540), crt-1(bz30), cnx-1(nr2010), tra-3(ok2207), or asp-4(ok2693) mutations into the TDP-43WT strain, but none of the mutations suppressed the paralysis phenotype caused by TDP-43WT (Fig. 7). However, TDP-43WT; unc-68(e540) animals had a higher rate of paralysis compared with TDP-43WT controls (p < 0.05), suggesting that a general impairment of UNC-68 function may negatively impact the neuronal function and motility observed in TDP-43WT worms. Thus, we conclude that neuroprotective effects of these mutants against TDP-43A315T toxicity are not due to a general improvement of motor function. Calcium homeostasis and protease genes do not suppress motility defects in TDP-43WT animals. There was no significant suppression of TDP-43WT motility defects by Ca2+ or protease gene mutations. p < 0.001 for TDP-43A315T versus TDP-43WT. TDP-43A315T, n = 81; TDP-43WT, n = 65; TDP-43WT; crt-1(bz30), n = 71; TDP-43WT; itr-1(sa73), n = 71; TDP-43WT; unc-68(e540), n = 60; TDP-43WT; cnx-1(nr2010), n = 61; TDP-43WT; tra-3(ok2207), n = 71; TDP-43WT; asp-4(ok2693), n = 115. Ca2+ is an intracellular signaling molecule that regulates many mechanisms in the nervous system (Nikoletopoulou and Tavernarakis, 2012). Cells maintain a tightly controlled resting cytosolic free calcium concentration of ∼100 nm by extruding excess Ca2+ by pumps and exchangers, and by compartmentalizing Ca2+. The ER is involved in many critical processes, including being a specialized Ca2+-storing organelle (100–800 μm range). The ER is closely involved in the regulation of Ca2+ flow within cells and is found in all neurons, occupying cell bodies, and extending toward axons, dendrites, and dendritic spines. In the context of ALS, evidence is mounting that the capacity of the cellular machinery of the ER to properly fold proteins is exceeded (Hetz and Mollereau, 2014), leading cells to react with the UPRER and that a perturbation of the ER function can induce Ca2+ depletion. Studies investigating Ca2+ homeostasis in motor neurons have shown that ALS-vulnerable motor neurons in mice display low endogenous Ca2+ buffering capacities (Lips and Keller, 1998; Palecek et al., 1999). We hypothesized that dysregulated [Ca2+]I, possibly from the release of ER Ca2+ stores, may contribute to mutant TDP-43 neuronal toxicity. We tested for potential influences of Ca2+ in mutant TDP-43A315T-induced degeneration in the following two ways: with genetic mutations that alter release of ER Ca2+ stores; and by using chemical reagents to manipulate ER Ca2+ release (Fig. 8). We found that null mutations in crt-1, a molecular chaperone that plays a critical and complex role in cellular calcium homeostasis as a major site for stored Ca2+ (Michalak et al., 1999), suppressed both paralysis and neurodegeneration induced by mutant TDP-43. Dysregulation of the ER-resident Ca2+ binding protein calreticulin may directly contribute to motor neuron death in ALS models (Bernard-Marissal et al., 2012). Our data showing that calreticulin contributes to neurodegeneration is somewhat at odds with findings for an SOD-1 model showing that reduced calreticulin levels activate the FAS/CD95 pathway to trigger cell death (Bernard-Marissal et al., 2012). However, no clear ortholog of FAS/CD95 exists in the C. elegans genome, suggesting that the role of calreticulin in mediating TDP-43 neuronal toxicity in our study may follow different cellular mechanisms. Alternatively, the mechanisms governing the degradation of SOD1 proteins may be distinct from TDP-43 (Mulligan and Chakrabartty, 2013). Working model for TDP-43 and Ca2+-dependent necrosis-like neuronal toxicity. 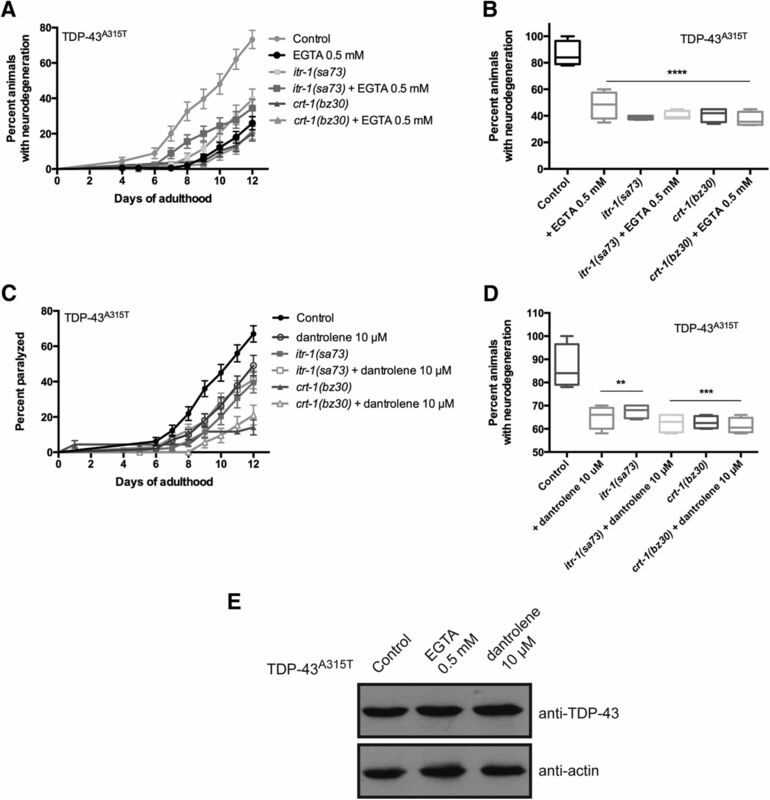 The chronic stress induced by protein misfolding and aggregation of mutant TDP-43 proteins may lead to inappropriate release of Ca2+ from ER stores into the cytoplasm. The resultant [Ca2+]i increase is essential for downstream events, including activation of the Ca2+-regulated TRA-3 calpain protease, which in turn mediates leakage of killer aspartyl proteases (ASP-4), leading to neuronal dysfunction and cell death. Mutations affecting ER Ca2+ storage (calreticulin and calnexin) or ER calcium release (InsP3R and RYR calcium release channels) disrupt release and are therefore neuroprotective. Pharmacological reduction of [Ca2+]i by EGTA or dantrolene is also neuroprotective, while a forced increase of [Ca2+]i by thapsigargin enhances neuronal toxicity. Disabling the activity of calpain or aspartyl proteases also protects against TDP-43-associated neuronal dysfunction and degeneration. However, ER stress has emerged as a mechanism in ALS (Matus et al., 2013; Tadic et al., 2014), and has been linked to the motor neuron vulnerability observed in SOD-1 mouse models (Nishitoh et al., 2008; Saxena et al., 2009), but it remains to be seen whether the ER is a site of action for other ALS mouse models. Furthermore, many aspects of the genetic signaling pathways controlling ER stress response were discovered in C. elegans and are conserved in mammalian systems (Mori, 2009). Encouragingly, we previously linked the ER stress response to TDP-43 toxicity (Vaccaro et al., 2013), and identified a number of small molecules that reduce neurodegeneration in C. elegans and zebrafish TDP-43 motor neuron models. Further insights into the induction of the ER stress response and neurodegeneration come from a recent report using a C. elegans model of SOD1 neuronal toxicity (Thompson et al., 2014). Linking the model organism studies to mammals are the ER stress-protective compounds salubrinal (Saxena et al., 2009) and guanabenz (Jiang et al., 2014), both of which show neuroprotective activity in mouse SOD-1 models. Thus, work from C. elegans models may be predictive for mechanisms of motor neuron degeneration in mammalian systems. Because luminal calreticulin works in conjunction with calnexin to effectuate chaperone functions and mediate cellular Ca2+ homeostasis (Krause and Michalak, 1997), we also disrupted calnexin function using loss-of-function mutations and confirmed the suppression of TDP-43 neuronal toxicity. It is known that Ca2+ is released from ER stores into the cytoplasm via the InsP3R and the RyR Ca2+ channels. We blocked the RyR function by using a null mutation in unc-68 or by treatment with dantrolene, a reagent that specifically inhibits Ca2+ release from ER stores (Song et al., 1993), and InsP3R by using a null mutation in itr-1, and we showed the same suppression of TDP-43 toxicity. Thus, our data extend upon and are consistent with recent work showing that inositol triphosphate receptors regulate neurotoxicity in Drosophila and cell culture TDP-43 models (Kim et al., 2012). Further highlighting the role of Ca2+ homeostasis, treatment of TDP-43A315T mutants with EGTA, a Ca2+-specific chelator, produced a clear reduction of paralysis and neurodegeneration phenotypes. Importantly, the fact that neither dantrolene nor EGTA enhanced TDP-43 toxicity in TDP-43A315T; crt-1 or TDP-43A315T; itr-1 double mutants suggests that the inappropriate release of Ca2+ from ER stores may be a common mechanism of TDP-43-mediated neuronal toxicity. 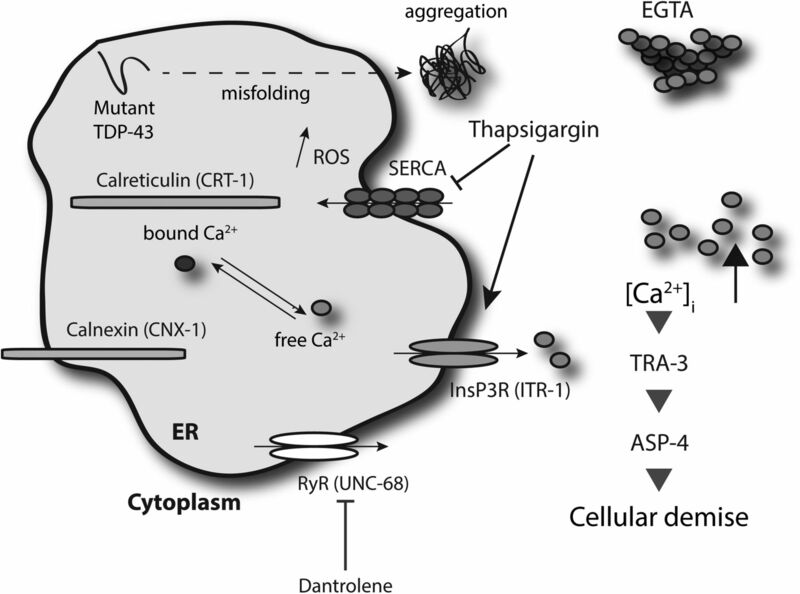 Conversely, thapsigargin-induced ER Ca2+ release, by activating the InsP3R function and blocking the Ca2+ return to the ER from the cytoplasm via the SERCA Ca2+ pump, can restore TDP-43A315T-induced cell death in the absence of calreticulin, indicating that Ca2+ release and uptake are essential for TDP-43A315T neuronal toxicity, and can in fact also enhance the toxicity of worms expressing TDP-43WT in motor neurons. Our group (Vaccaro et al., 2012b), plus another research team (Zhang et al., 2012), previously reported that endogenous TDP-1 (C. elegans ortholog of TDP-43) is required for toxicity caused by the transgenic expression of mutant TDP-43 in the C. elegans nervous system. Additionally, we also showed that TDP-1/TDP-43 is required for the toxicity of mutant polyglutamine proteins in C. elegans and mammalian cell culture models of Huntington's disease (Tauffenberger et al., 2013). These findings suggest that wild-type TDP-1/TDP-43 may actively contribute to neurodegeneration beyond ALS. Our previous work also showed that tdp-1 is ubiquitously expressed, and is mainly a nuclear protein. Under stress conditions, including ER stress, TDP-1 expression is increased, and this chronic, elevated expression is cytotoxic, leading to decreased lifespan in worms (Vaccaro et al., 2012b). These observations are consistent with the function of TDP-43 as a stress-inducible protein, as is seen in many systems (Janssens and Van Broeckhoven, 2013). Another conserved phenotype of TDP-43 is its cytotoxicity when overexpressed, suggesting that its expression levels are tightly regulated (Buratti and Baralle, 2011). A caveat of our data interpretation in this current study is that a role for TDP-1 in the necrosis-like degeneration of TDP-43A315T motor neurons was not examined. Part of the cascade of molecular events described here leading to neurodegeneration may involve endogenous TDP-1. The cytotoxicity of TDP-1 itself may depend on Ca2+ homeostasis and/or protease genes. Additionally, since TDP-1 is a DNA/RNA binding protein, another possibility is that TDP-1 may regulate the expression of Ca2+ and protease genes under stress conditions, including for proteotoxicity and ER stress. Future studies will explore the contribution of TDP-1 to these molecular mechanisms. The perturbation of cytosolic Ca2+ homeostasis has been implicated in necrotic cell death both in mammals and in C. elegans (Sattler and Tymianski, 2000; Xu et al., 2001), but the mechanism by which Ca2+ triggers cellular demise remains unclear; so, we investigated relevant signaling pathways based upon the “calpain–cathepsin hypothesis.” In 1998, Yamashima et al. formulated the calpain–cathepsin hypothesis, according to which Ca2+-activated cysteine proteases compromise the integrity of the lysosome and cause leakage of acidic hydrolases (Yamashima et al., 1998). We tested the requirement for calpain and aspartyl protease activity in neurodegeneration inflicted by the expression of TDP-43A315T in GABAergic motor neurons, and showed that null mutations in the calcium-regulated tra-3 calpain protease and aspartyl protease asp-4 suppress both paralysis and neurodegeneration. Interestingly, TDP-43A315T toxicity was unaffected by a null mutation in the cysteine–aspartate protease CED-3, a protein central to apoptosis in C. elegans, and in agreement with previous studies of TDP-43 toxicity in C. elegans (Liachko et al., 2010). Thus, in terms of genetic signaling pathways the neuronal toxicity caused by TDP-43A315T in C. elegans more closely resembles necrosis than classic apoptosis (Troulinaki and Tavernarakis, 2012). Recent work has suggested that motor neuron death in models of both sporadic and familial ALS occurs through necroptosis (Re et al., 2014), a form of programmed necrosis that does not require caspases (Ofengeim and Yuan, 2013). Our work is in agreement with this notion as inactivation of a C. elegans key executioner caspase, ced-3, had no effect on motor neuron dysfunction in our TDP-43 models. Key molecules regulating necroptosis in ALS models include the receptor-interacting serine/threonine-protein kinase 1 and mixed-lineage kinase domain-like, but whether orthologs of these proteins regulate TDP-43 toxicity in our C. elegans ALS models requires further investigation. Importantly, work from C. elegans detailing programmed necrosis may shed light on mechanisms relevant to neurodegeneration in mammalian settings and perhaps specifically ALS. Abnormal Ca2+ signaling has been linked to multiple neurological disorders, but the challenge remains in identifying disease-specific mechanisms (Bezprozvanny, 2009). We propose that the chronic stress induced by misfolded mutant TDP-43 proteins induces the inappropriate release of Ca2+ from ER stores into the cytoplasm is a trigger for subsequent neurodegeneration (Fig. 8). Disrupted Ca2+ homeostasis may have multiple downstream, effector mechanisms promoting neuronal dysfunction and cell death, including the inappropriate activation of the Ca2+-dependent proteases identified here, disrupting mitochondrial activity (Tradewell et al., 2011; Parone et al., 2013), or altered Ca2+ signaling at the neuromuscular junction (Armstrong and Drapeau, 2013). Thus, restoration of Ca2+ homeostasis in ALS motor neurons and/or limiting programmed necrosis may be pursued as potential therapeutic interventions. Some strains were provided by the Caenorhabditis Genetics Center, which is funded by the National Institutes of Health Office of Research Infrastructure Programs (P40 OD010440). This research was supported by the CHUM Foundation, the ALS Society of Canada, the Canadian Institutes of Health Research, the Fonds de Recherche Santé Québec, the Muscular Dystrophy Association (U.S.), and the Congressionally Directed Medical Research Program Amyotrophic Lateral Sclerosis Research Program (U.S.), and a Canadian Institutes of Health Research New Investigator Award to J.A.P. We thank S. Peyrard for technical help. (2013) Calcium channel agonists protect against neuromuscular dysfunction in a genetic model of TDP-43 mutation in ALS. J Neurosci 33:1741–1752, doi:10.1523/JNEUROSCI.4003-12.2013, pmid:23345247. (2012) Reduced calreticulin levels link endoplasmic reticulum stress and Fas-triggered cell death in motoneurons vulnerable to ALS. J Neurosci 32:4901–4912, doi:10.1523/JNEUROSCI.5431-11.2012, pmid:22492046. (2013) Protein aggregation in amyotrophic lateral sclerosis. Acta Neuropathol 125:777–794, doi:10.1007/s00401-013-1125-6, pmid:23673820. (2011) TDP-43: new aspects of autoregulation mechanisms in RNA binding proteins and their connection with human disease. FEBS J 278:3530–3538, doi:10.1111/j.1742-4658.2011.08257.x, pmid:21777388. (2006) Biophysical re-equilibration of Ca2+ fluxes as a simple biologically plausible explanation for complex intracellular Ca2+ release patterns. FEBS Lett 580:463–468, doi:10.1016/j.febslet.2005.12.042, pmid:16386246. (1999) The inositol trisphosphate receptor regulates a 50-second behavioral rhythm in C. elegans. Cell 98:757–767, doi:10.1016/S0092-8674(00)81510-X, pmid:10499793. (1986) Genetic control of programmed cell death in the nematode C. elegans. Cell 44:817–829, doi:10.1016/0092-8674(86)90004-8, pmid:3955651. (2011) Programmed cell death in animal development and disease. Cell 147:742–758, doi:10.1016/j.cell.2011.10.033, pmid:22078876. (2014) Disturbance of endoplasmic reticulum proteostasis in neurodegenerative diseases. Nat Rev Neurosci 15:233–249, doi:10.1038/nrn3689, pmid:24619348. (2013) Pathological mechanisms underlying TDP-43 driven neurodegeneration in FTLD-ALS spectrum disorders. Hum Mol Genet 22:R77–R87, doi:10.1093/hmg/ddt349, pmid:23900071. (2014) Guanabenz delays the onset of disease symptoms, extends lifespan, improves motor performance and attenuates motor neuron loss in the SOD1 G93A mouse model of amyotrophic lateral sclerosis. Neuroscience 277C:132–138, doi:10.1016/j.neuroscience.2014.03.047, pmid:24699224. (2008) TARDBP mutations in individuals with sporadic and familial amyotrophic lateral sclerosis. Nat Genet 40:572–574, doi:10.1038/ng.132, pmid:18372902. (2012) High-content RNAi screening identifies the Type 1 inositol triphosphate receptor as a modifier of TDP-43 localization and neurotoxicity. Hum Mol Genet 21:4845–4856, doi:10.1093/hmg/dds321, pmid:22872699. (1997) Calreticulin. Cell 88:439–443, doi:10.1016/S0092-8674(00)81884-X, pmid:9038335. (1998) Endogenous calcium buffering in motoneurones of the nucleus hypoglossus from mouse. J Physiol 511:105–117, doi:10.1111/j.1469-7793.1998.105bi.x, pmid:9679167. (1999) Molecular basis of the neurodegenerative disorders. N Engl J Med 340:1970–1980, doi:10.1056/NEJM199906243402507, pmid:10379022. (1996) unc-68 encodes a ryanodine receptor involved in regulating C. elegans body-wall muscle contraction. J Cell Biol 134:885–893, doi:10.1083/jcb.134.4.885, pmid:8769414. (2013) ER dysfunction and protein folding stress in ALS. Int J Cell Biol 2013:674751, doi:10.1155/2013/674751, pmid:24324498. (1999) Calreticulin: one protein, one gene, many functions. Biochem J 344:281–292, doi:10.1042/0264-6021:3440281, pmid:10567207. (2009) Signalling pathways in the unfolded protein response: development from yeast to mammals. J Biochem 146:743–750, doi:10.1093/jb/mvp166, pmid:19861400. (2013) Protein misfolding in the late-onset neurodegenerative diseases: common themes and the unique case of amyotrophic lateral sclerosis. Proteins 81:1285–1303, doi:10.1002/prot.24285, pmid:23508986. (2012) Calcium homeostasis in aging neurons. Front Genet 3:200, doi:10.3389/fgene.2012.00200, pmid:23060904. (2008) ALS-linked mutant SOD1 induces ER stress- and ASK1-dependent motor neuron death by targeting Derlin-1. Genes Dev 22:1451–1464, doi:10.1101/gad.1640108, pmid:18519638. (2013) Regulation of RIP1 kinase signalling at the crossroads of inflammation and cell death. Nat Rev Mol Cell Biol 14:727–736, doi:10.1038/nrm3683, pmid:24129419. (1999) Calcium dynamics and buffering in motoneurones of the mouse spinal cord. J Physiol 520:485–502, doi:10.1111/j.1469-7793.1999.00485.x, pmid:10523417. (2013) Enhancing mitochondrial calcium buffering capacity reduces aggregation of misfolded SOD1 and motor neuron cell death without extending survival in mouse models of inherited amyotrophic lateral sclerosis. J Neurosci 33:4657–4671, doi:10.1523/JNEUROSCI.1119-12.2013, pmid:23486940. (2008) Lysosomal enzyme cathepsin D protects against alpha-synuclein aggregation and toxicity. Mol Brain 1:17, doi:10.1186/1756-6606-1-17, pmid:19021916. (2014) Necroptosis drives motor neuron death in models of both sporadic and familial ALS. Neuron 81:1001–1008, doi:10.1016/j.neuron.2014.01.011, pmid:24508385. (2014) State of play in amyotrophic lateral sclerosis genetics. Nat Neurosci 17:17–23, doi:10.1038/nn.3584, pmid:24369373. (2000) Molecular mechanisms of calcium-dependent excitotoxicity. J Mol Med 78:3–13, doi:10.1007/s001090000077, pmid:10759025. (1993) Increased intracellular Ca2+: a critical link in the pathophysiology of sepsis? Proc Natl Acad Sci U S A 90:3933–3937, doi:10.1073/pnas.90.9.3933, pmid:8483913. (2006) Maintenance of C. elegans. WormBook, 1–11, pmid:18050451. (2002) Specific aspartyl and calpain proteases are required for neurodegeneration in C. elegans. Nature 419:939–944, doi:10.1038/nature01108, pmid:12410314. (2014) The ER mitochondria calcium cycle and ER stress response as therapeutic targets in amyotrophic lateral sclerosis. Front Cell Neurosci 8:147, doi:10.3389/fncel.2014.00147, pmid:24910594. (1989) Activation of calcium entry by the tumor promoter thapsigargin in parotid acinar cells. Evidence that an intracellular calcium pool and not an inositol phosphate regulates calcium fluxes at the plasma membrane. J Biol Chem 264:12266–12271, pmid:2663854. (2013) Reduction of polyglutamine toxicity by TDP-43, FUS and progranulin in Huntington's disease models. Hum Mol Genet 22:782–794, doi:10.1093/hmg/dds485, pmid:23172908. (2000) Aspartic proteases from the nematode Caenorhabditis elegans. Structural organization and developmental and cell-specific expression of asp-1. J Biol Chem 275:26359–26369, doi:10.1074/jbc.M000956200, pmid:10854422. (2011) Calcium dysregulation, mitochondrial pathology and protein aggregation in a culture model of amyotrophic lateral sclerosis: mechanistic relationship and differential sensitivity to intervention. Neurobiol Dis 42:265–275, doi:10.1016/j.nbd.2011.01.016, pmid:21296666. (2012) Endocytosis and intracellular trafficking contribute to necrotic neurodegeneration in C. elegans. EMBO J 31:654–666, doi:10.1038/emboj.2011.447, pmid:22157748. (2012a) Mutant TDP-43 and FUS cause age-dependent paralysis and neurodegeneration in C. elegans. PLoS One 7:e31321, doi:10.1371/journal.pone.0031321, pmid:22363618. (2012b) TDP-1/TDP-43 regulates stress signaling and age-dependent proteotoxicity in Caenorhabditis elegans. PLoS Genet 8:e1002806, doi:10.1371/journal.pgen.1002806, pmid:22792076. (2000) Calcium dynamics and buffering in oculomotor neurones from mouse that are particularly resistant during amyotrophic lateral sclerosis (ALS)-related motoneurone disease. J Physiol 525:433–445, doi:10.1111/j.1469-7793.2000.t01-1-00433.x, pmid:10835045. (2008) Low Ca2+ buffering in hypoglossal motoneurons of mutant SOD1 (G93A) mice. Neurosci Lett 445:224–228, doi:10.1016/j.neulet.2008.08.084, pmid:18782598. (2011) Stress signaling from the endoplasmic reticulum: a central player in the pathogenesis of amyotrophic lateral sclerosis. IUBMB Life 63:754–763, doi:10.1002/iub.520, pmid:21834058. (2009) Amyotrophic lateral sclerosis. Orphanet J Rare Dis 4:3, doi:10.1186/1750-1172-4-3, pmid:19192301. (2001) Necrotic cell death in C. elegans requires the function of calreticulin and regulators of Ca(2+) release from the endoplasmic reticulum. Neuron 31:957–971, doi:10.1016/S0896-6273(01)00432-9, pmid:11580896. (1998) Inhibition of ischaemic hippocampal neuronal death in primates with cathepsin B inhibitor CA-074: a novel strategy for neuroprotection based on ‘calpain-cathepsin hypothesis’ Eur J Neurosci 10:1723–1733, doi:10.1046/j.1460-9568.1998.00184.x, pmid:9751144. (2012) Caenorhabditis elegans RNA-processing protein TDP-1 regulates protein homeostasis and life span. J Biol Chem 287:8371–8382, doi:10.1074/jbc.M111.311977, pmid:22232551.